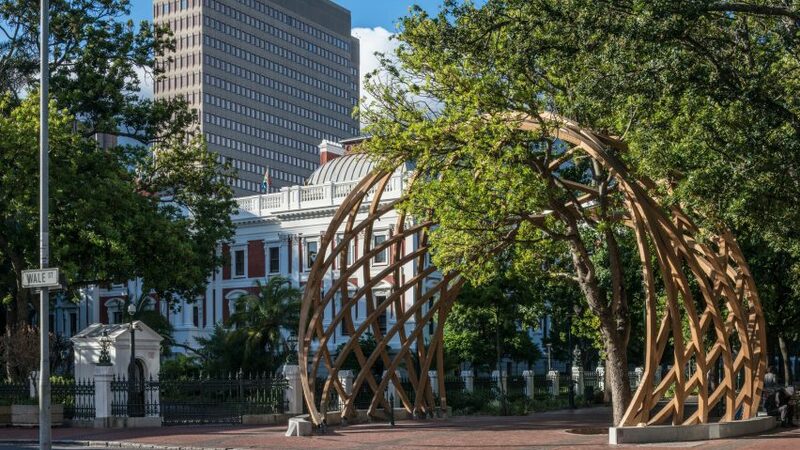 Architecture firms Snøhetta and Local Studio celebrate South African anti-apartheid activist Desmond Tutu with this monumental arch, which was unveiled in downtown Cape Town during this year's Design Indaba. 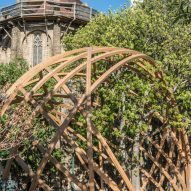 Called Arch for Arch, the memorial structure was created to commemorate the tireless efforts of Tutu – the nation's first black archbishop – in campaigning for democracy in the late 1970s and early 80s, earning him the nickname "the arch". 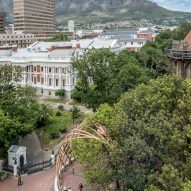 "The Arch for Arch is more than a monument for Archbishop Tutu," explained designers from Snøhetta and Local Studio, who collaborated on the project. "It builds on the legacy of South Africa's foremost campaigner for democracy to create a platform for public participation in upholding the constitution," they said. "The arch will stand as a permanent tribute to what was sacrificed in the pursuit of democracy, and the vital necessity of protecting these rights for generations to come." "The moment was unforgettable and there was not a dry eye in the audience," the designers told Dezeen. "The archbishop danced to the accompanying choral ensemble and the audience all connected in moment of unity, fulfilment, encouragement and energy." The completed version was unveiled on 7 October 2017, Tutu's 86th birthday, and it formed a key attraction at Design Indaba 2018. It is located between the national parliament and St George's Cathedral, on a site that Tutu himself used during anti-apartheid protests. "We felt it was important to move away from the conventions that are associated with the design of traditional monuments, by using warmer, tactile materials like wood, which invite people to engage directly with the piece," said the designers. 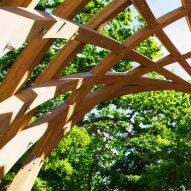 "Since the arch has been installed, we have seen people interact with it in a variety of ways, not just walking in, through and around it, but sitting on it, perched up for a better view," they continued. "This kind of social engagement is a better representation in our mind of Tutu's legacy." The aim was to create a link between this institution, which is South Africa's highest judicial court, and the national parliament.